This is a heavy duty rack suitable for light commercial environments, weighing in at a solid 142 lbs. Lighter duty racks of a similar design weigh well under 100 lbs. Similiar to the York #69126 but with an extra tier, longer shelves, and a slightly wider channel in the shelves to accommodate users with large hands grabbing dumbbells. It's also a significant upgrade over the York Economy dumbbell racks, featuring heavier tubing and rubber feet. Three tiers give you the best reasonable use of limited floor space. Store a full 5-75lb set of hex dumbbells! The open channel in the shelves is 5" wide. Most dumbbells have handles over 5" long and will fit. 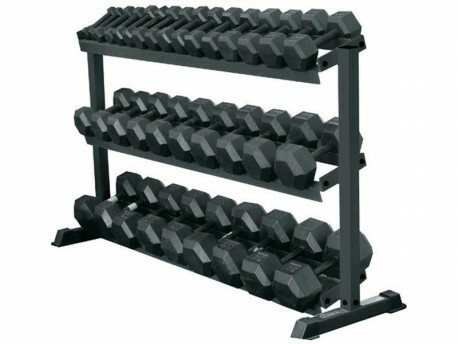 Note that the York Legacy dumbbells have unusually short handles and won't fit.